A Peace Pagoda is a Buddhist stupa; a monument to inspire peace, designed to provide a focus for people of all races and creeds, and to help unite them in their search for world peace. Most (though not all) peace pagodas built since World War II have been built under the guidance of Nichidatsu Fujii (1885–1985), a Buddhist monk from Japan and founder of the Nipponzan-Myōhōji Buddhist Order. Fujii was greatly inspired by his meeting with Mahatma Gandhi in 1931 and decided to devote his life to promoting non-violence. In 1947, he began constructing Peace Pagodas as shrines to world peace. The first was inaugurated at Kumamoto in 1954. Peace Pagodas were built as a symbol of peace in Japanese cities including Hiroshima and Nagasaki where the atomic bombs took the lives of over 150,000 people, almost all of whom were civilian, at the end of World War II. By 2000, eighty Peace Pagodas had been built around the world in Europe, Asia, and the United States. 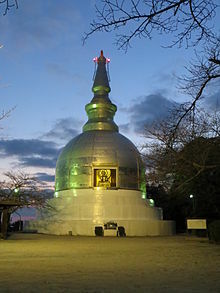 The Nipponzan-Myōhōji monks of the New England Peace Pagoda were awarded the Courage of Conscience award June 5, 1998 in Sherborn, Massachusetts. World Peace Pagoda Analayo (23°25′32″N 91°08′04″E﻿ / ﻿23.425505°N 91.134444°E﻿ / 23.425505; 91.134444﻿ (World Peace Pagoda Analayo)) is located at the premises of New Salban Vihara, Comilla. 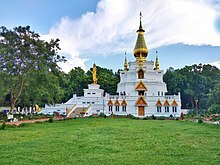 It is the first Thai architecture Pagoda in Bangladesh and which was designed by Thai architect. The 100 feet tall Pagoda is rich in Thai artistic beauty both inside and outside. A 30 feet Standing Buddha image installed in front of the pagoda is a symbol of compassion and kindness. It is inaugurated in 2017. Founder: Venerable Sugato Bhikkhu by the support of his spiritual teacher Most Venerable Phrathep Mongkolyarn chief abbot of Wat Phutthabucha, Bangkok, Thailand with his Thai devotees. Shanti Stupa (Peace Pagoda) at Rajgir. The Rajgir Vishwa Shanti Stupa/World Peace Pagoda (25°00′16″N 85°26′40″E﻿ / ﻿25.004553°N 85.444539°E﻿ / 25.004553; 85.444539﻿ (Rajgir Peace Pagoda)) was completed in 1969 at Rajgir hills near Rajgir, near the Vulture's Peak where the Buddha is believed to have preached the Lotus Sutra. The dedication coincided with the 100th anniversary of the birth of Mahatma Gandhi. The site also includes a Nipponzan Myohoji temple. The shanthi stupas in India were established by Fuji Guru for World Peace. The Nipponzan Myōhōji Buddhist temple at Charlimont in Darjeeling (27°01′39″N 88°15′32″E﻿ / ﻿27.027585°N 88.259012°E﻿ / 27.027585; 88.259012﻿ (Darjeeling Peace Pagoda)) is one of them. Work on the Stupa began in 1972 and it was dedicated on November 1, 1992. Vishwa Shanti Stupa (World Peace Pagoda), Delhi. A Vishwa Shanti Stupa/World Peace Pagoda in New Delhi (28°36′08″N 77°15′12″E﻿ / ﻿28.602352°N 77.253413°E﻿ / 28.602352; 77.253413﻿ (Vishwa Shanti Delhi Peace Pagoda)) was inaugurated on 20th. November 2007 by monks and nuns of Nipponzan-Myōhōji, the Dalai Lama and the Lt. Governor of Delhi. It is situated in Millennium Indraprastha Park, North-East of Humayun's Tomb, adjacent to Delhi Ring Road. A traditional Japanese garden has been constructed in the area around the stupa. The garden is a joint project by the Fujii Guruji Vishwa Shanti Stupa Committee and the Delhi Development Authority. 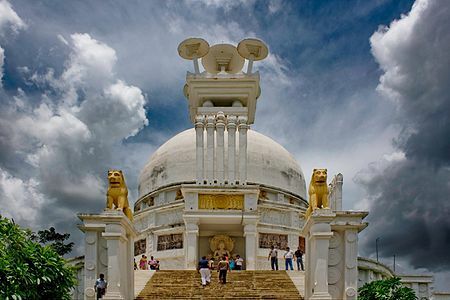 The Dhauli Giri Shanti Stupa (Peace Pagoda) was built in Bhubaneswar, Orissa State, India (20°11′33″N 85°50′22″E﻿ / ﻿20.192392°N 85.839454°E﻿ / 20.192392; 85.839454﻿ (Dhauli Giri Peace Pagoda)) during a two-year period, and was inaugurated on November 8, 1972. 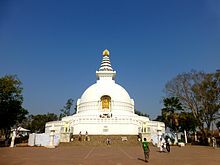 It was established by Sri Nitya Nanda Kanungo, Governor of Bihar, with the spiritual guidance of Nichidatsu Fujii, whose monks helped build the Peace Pagoda. 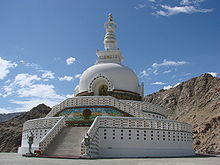 The Shanti Stupa in Ladakh (Jammu and Kashmir) was built by Nipponzan-Myōhōji monks, headed by Head monk Nakamura, with the help of local people. The Shanti Stupa holds the relics of the Buddha at its base, enshrined by the 14th Dalai Lama himself It is situated at a hilltop in Changspa village providing a bird's eye view of Leh town and the surrounding mountain peaks. The 14th and current Dalai Lama inaugurated the Shanti Stupa in August 1985. 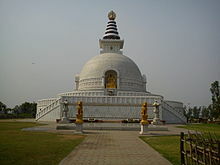 The stupa at Vaishali was inaugurated 23 October 1996. 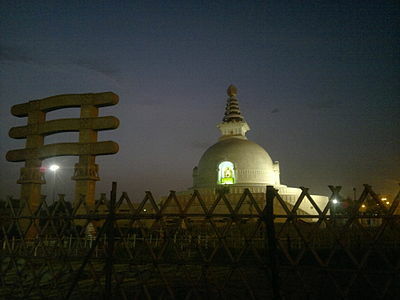 Vaishali is an important place in the life of the Buddha. Vishwa Shanti stupa was a dream of Nichidatsu Fujii. It is beside Gitai Mandir. 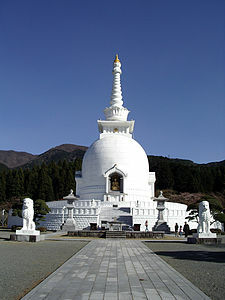 It is a large stupa of white color. Statues of Buddha are mounted on the stupa, facing in four directions. It also has a small Japanese Buddhist temple with a large park.There is a temple near the stupa where prayers are done for universal peace. Work on Hanaokayama Peace Pagoda, the first Peace Pagoda constructed by Nipponzan Myohoji Japanese Buddhist monks, began in 1947 atop Mount Hanaoka, Kumamoto (32°47′48″N 130°41′09″E﻿ / ﻿32.796605°N 130.685959°E﻿ / 32.796605; 130.685959﻿ (Hanaokayama Peace Pagoda)) with basic hand tools. It took seven years to build, being inaugurated in 1954: it was the first of over 80 built by Fujii and his followers all over the world. The Hiroshima Peace Pagoda  (34°24′21″N 132°28′41″E﻿ / ﻿34.4058702°N 132.4779358°E﻿ / 34.4058702; 132.4779358﻿ (Hiroshima Peace Pagoda)) was built in 1966 by Nipponzan Myohoji Buddhist monks. It commemorate the lives lost in the A-bomb blast, and contains gifts of Buddha's ashes from the then Prime Minister of India and Mongolian Buddhists. It is notable for being built partially of steel. The Peace Pagoda in Nagasaki, the site of the second A-Bomb attack, was inaugurated by Nipponzan in 1970. At Mount Kiyosumi, the most predominant ceremonies held by Nipponzan tend to take place. 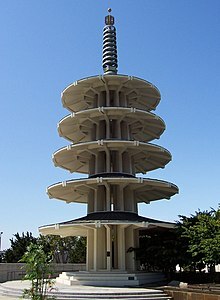 The Pagoda was inaugurated in 1969. Built in 1984, dedicated May 13, 2001, the peace pagoda at Narita-shi in Chiba Prefecture, Japan (35°44′29″N 140°23′54″E﻿ / ﻿35.741317°N 140.398277°E﻿ / 35.741317; 140.398277﻿ (Narita-shi Peace Pagoda)) is 58 m high and situated on a small hill. Founded in 1964, the Gotemba Peace Pagoda in Shizuoka Prefecture, Japan (35°17′05″N 138°57′23″E﻿ / ﻿35.284637°N 138.956364°E﻿ / 35.284637; 138.956364﻿ (Gotemba World Peace Pagoda)) includes a Nipponzan-Myōhōji temple. This Peace Pagoda (Stupa) was built by Nipponzan-Myōhōji monks in 1959 halfway up Mount Moiwa (43°01′49″N 141°19′51″E﻿ / ﻿43.030385°N 141.330728°E﻿ / 43.030385; 141.330728﻿ (Sapporo Peace Pagoda)). It was built to commemorate peace after World War II and can be seen from almost anywhere in Sapporo. It contains some of the ashes of the Buddha that were presented to the Emperor of Japan by Prime Minister Nehru in 1954. Later, another part of these were presented to Mikhail Gorbachev by the famous Nipponzan-Myōhōji monk, Junsei Terasawa. The Stupa is built in Jeju Island on the site where Venerable Masters Bowoo (d. 1565) and Jiahn (d. 1729) died. They gave their lives for Buddhism. The Stupa is the centre of many activities for the propagation of world peace and the unification of Korea. One such activity is the Lotus Sutra writing movement, and on August 15 each year people come and place hand-written copies of the Lotus Sutra into the Pagoda. This stupa is not associated with Nipponzan-Myōhōji. The Lumbini Shanti Stupa/Peace Pagoda (27°29′56″N 83°16′35″E﻿ / ﻿27.4989001°N 83.2762546°E﻿ / 27.4989001; 83.2762546﻿ (Lumbini World Peace Pagoda)) in Nepal was constructed by Nipponzan Myohoji monks and dedicated in November 2001 at the Buddhist pilgrimage site in kapilvastu district lumbini zone Nepal, where Queen Mayadevi is said to have given birth to Siddhartha Gautama, who in turn, as the Buddha Gautama, gave birth to the Buddhist tradition. Balanced on a narrow ridge high above Phewa Tal, the brilliant-white Shanti Stupa in Pokhara is a massive Buddhist stupa which was constructed by Buddhist monks from the Japanese Nipponzan Myōhōji organisation. Besides being an impressive sight in itself, the shrine is a vantage point which has views of the Annapurna range and Pokhara city.The shining golden statue depicts the Buddha in the posture he assumed when he was born. The Ampara Peace Pagoda (7°17′07″N 81°39′14″E﻿ / ﻿7.2852855°N 81.6539499°E﻿ / 7.2852855; 81.6539499﻿ (Ampara Peace Pagoda)) was built by Nipponzan monks under the leadership of Nichidatsu Fujii and was inaugurated on February 27, 1988. Ceremonies here are attended by large numbers of people. The Bandarawela Peace Pagoda  (also known Sama Chethiya in Sinhala) (6°49′28″N 80°59′09″E﻿ / ﻿6.824508°N 80.98587°E﻿ / 6.824508; 80.98587﻿ (Bandarawela Peace Pagoda)) is located between the towns of Bandarawela Etampitiya road 6 Kilometers towards Bandarawela to Etampitiya. It was completed by Niponzan Myohoji monks in 1982. The Unawatuna Peace Pagoda (6°00′57″N 80°14′16″E﻿ / ﻿6.0158585°N 80.2377972°E﻿ / 6.0158585; 80.2377972﻿ (Unawatuna Peace Pagoda)), built by Nipponzan Myohoji monks, is on the headland between Unawatuna and Galle. The Walapane Peace Pagoda (7°05′23″N 80°51′40″E﻿ / ﻿7.089642°N 80.861027°E﻿ / 7.089642; 80.861027﻿ (Walapane Peace Pagoda)), built by Nichidatsu Fuhi monk, is located on Walapane, Central Province of Sri Lanka. This is also called Japanese Sama Viharaya Walapane. Peace Pagoda is an enormous shrine, recently restored to become one of the most prominent landmarks in Walapane. 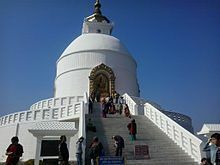 In addition Peace pagoda is located on a top of a mountain providing adorable views of a mountain range to the visitors. With many opportunities for tourists whom are eager to cycling and walking among the sites, this is a quite relaxing getaway from the busy life patterns. Created by the Kingdom of Nepal for the 1988 World Exposition, Brisbane's World Expo '88, the Brisbane Nepal Peace Pagoda is now a permanent commemorative structure of the Expo. It is located at the transformed Expo site, South Bank Parklands. The three-story Pagoda was constructed of 80 tons of art-carved Nepalese Terai timbers and assembled on the Expo site for the World Expo´88. It was relocated to its new riverfront location at the conclusion of the Expo for the opening of the Parklands in 1992. It now features commemorative displays of the Expo and is a place for quiet and reflection. It features a Peace Bell, and there is a Peace Post in the Pagoda garden. The Peace Pagoda in Brisbane was built by German architect Jochen Reier and architect Dean Ricker for the World EXPO´88 on behalf of the Kingdom of Nepal. Architect Jochen Reier has also constructed the Peace Pagoda in Munich, Germany, for the IGA ´83 and the World EXPO´90 Peace Pagoda in Osaka, Japan. This Pagoda is not associated with Nipponzan. The Peace Pagoda in Munich was built by German architect Jochen Reier (APAC) on behalf of the Kingdom of Nepal in 1982-1983. The temple has been constructed with 80 tons of precious Sissam timber (rose wood) logged in the Terai (lowlands of Nepal) and was then beautifully art-carved by hand. Over 300 Nepalese artisans in the Kathmandu area helped building it. The Kingdom of Nepal was awarded with the gold medal for best nation building of the IGA´83 in Munich. 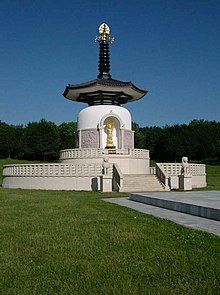 Today the Peace Pagoda is part of Munich Westpark because thousands of citizens and visitors helped to keep the "Asian Essemble" - and especially this Nepalese Shiva Pagoda - as a constantly remaining symbol of World Peace. The Vienna Peace Pagoda, on the Danube River, (48°11′28″N 16°27′17″E﻿ / ﻿48.1912047°N 16.4548101°E﻿ / 48.1912047; 16.4548101﻿ (Vienna Peace Pagoda)) was built on land donated by Elisabeth Lindmayer. Nipponzan Myohoji monks constructed the Pagoda, which was completed in 1983, the first peace pagoda in continental Europe. The Nipponzan Myohoji order led by Rev. Gyosei Masunaga have been active here for 25 years. 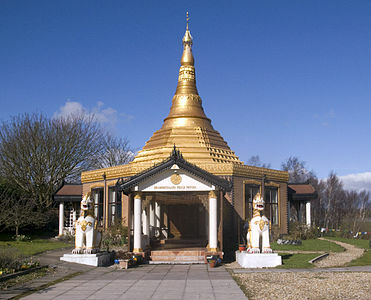 On 26 June 1998, the Dhamma Talaka Pagoda was dedicated in the Ladywood district of Birmingham. The Burmese monk and scholar, Aggamahapandita Rewata Dhamma, was the prime mover behind the planning of the pagoda and the new monastic complex that developed on the same grounds. Enshrined above its dome are Buddha relics once belonging to the Burmese royal family. The building therefore serves as a pilgrimage site and a focus for the Burmese community in Britain. The Milton Keynes Peace Pagoda (52°03′28″N 0°43′32″W﻿ / ﻿52.057697°N 0.725436°W﻿ / 52.057697; -0.725436﻿ (Milton Keynes Peace Pagoda)) was completed in 1980 at the western edge of Willen lake in Willen, Milton Keynes. This was the first Nipponzan-Myōhōji Peace Pagoda in the western world. There is a Nipponzan-Myōhōji Order temple and monastery nearby (52°03′20″N 0°43′34″W﻿ / ﻿52.055436°N 0.726181°W﻿ / 52.055436; -0.726181﻿ (Nipponzan-Myōhōji Order temple and monastery)). The London Peace Pagoda (51°28′55″N 0°09′32″W﻿ / ﻿51.482018°N 0.159025°W﻿ / 51.482018; -0.159025﻿ (London Peace Pagoda)) was completed in 1985 on the south side of the River Thames in Battersea Park, London. Permission to build it was the last legislative act of the Greater London Council. The Comiso Peace Pagoda (36°57′45″N 14°38′02″E﻿ / ﻿36.9625422°N 14.6339001°E﻿ / 36.9625422; 14.6339001﻿ (Nipponzan-Myōhōji Order stupa at Comiso)), built by Nipponzan Myohoji monks, was dedicated on 24 May 1998, the Reverend Morishita at Comiso (Contrada Canicarao, 100) in Sicily, Italy near the NATO base there. 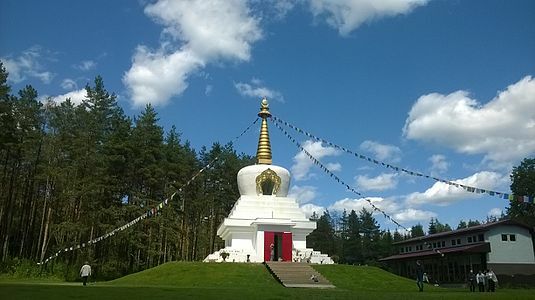 The Peace Pagoda in Latvia (56°39′46″N 23°57′33″E﻿ / ﻿56.662912°N 23.959158°E﻿ / 56.662912; 23.959158﻿ (Latvia Peace Pagoda)) was opened on 28 June 2014 near Garoza village in Salgale parish, Ozolnieki Municipality. A stupa has been constructed at the St Norbert Arts Centre in St. Norbert (Winnipeg, Manitoba), Canada. The Asociación Cultural Tibetana A.C. ("Garuda") is constructing a stupa at Los Álamos, Valle de Bravo, Mexico State under the patronage of Tenzin Wangyal Rinpoche. 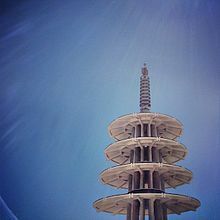 The Peace Pagoda in San Francisco (37°47′06″N 122°25′47″W﻿ / ﻿37.785054°N 122.429827°W﻿ / 37.785054; -122.429827﻿ (Peace Pagoda in San Francisco)) is a five-tiered concrete stupa in Nihonmachi (Japantown) between Post and Geary Streets at Buchanan. It is part of the Japan Center complex which opened in 1968. It was designed by Japanese architect Yoshiro Taniguchi and presented to San Francisco by the people of Osaka, Japan. This stupa is not associated with Nipponzan-Myōhōji. The New England Peace Pagoda (42°29′56″N 72°29′28″W﻿ / ﻿42.498994°N 72.491108°W﻿ / 42.498994; -72.491108﻿ (New England Peace Pagoda)) is the first Nipponzan-Myōhōji Peace Pagoda to be built in the US and was completed in 1985. The Franklin County Technical School brought students from their electrical, plumbing, and carpentry shops to assist in building the temple. 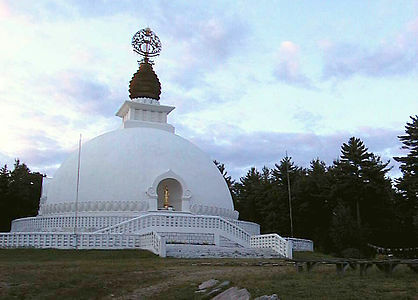 The Grafton Peace Pagoda in Petersburgh, New York (42°45′04″N 73°24′32″W﻿ / ﻿42.751109°N 73.408756°W﻿ / 42.751109; -73.408756﻿ (Grafton Peace Pagoda)) was founded by nun Jun Yasuda, who serves as its caretaker, and was dedicated in 1993. The site, originally donated by local activist Hank Hazelton and built over several years by the surrounding communities, includes a temple, gardens, pond and the pagoda. Each year on September 11, a group of marchers begin a walk at the Grafton Peace Pagoda Site and end in New York City two weeks later. As of January 2015[update], the Great Smoky Mountains Peace Pagoda (35°52′17″N 83°10′13″W﻿ / ﻿35.8713972°N 83.1702692°W﻿ / 35.8713972; -83.1702692﻿ (Great Smoky Mountains Peace Pagoda)) is under construction. Land for the construction of the Great Smoky Mountains Peace Pagoda was purchased in 2000 and, by the end of 2014, a temple, gardens, Stone Pagoda, Spirit Garden, and guest house had been completed. Construction of the Peace Pagoda/Stupa itself is ongoing. 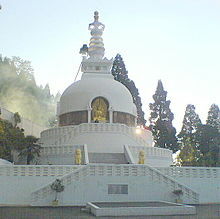 The architectural design of Darjeeling Peace Pagoda is the model for the Peace Pagoda in the Smoky Mountains. The Brisbane Nepal Peace Pagoda at South Bank Parklands. Peace Pagoda (Buddhist stupa) in Ampra, Sri Lanka. ^ "Nichidatsu Fujii: 1885 to 1985 Buddhist Monk, Teacher, Founder of the Nipponzan Myohoji Buddhist Order". Archived from the original on 2006-06-24. Retrieved 2017-06-16. 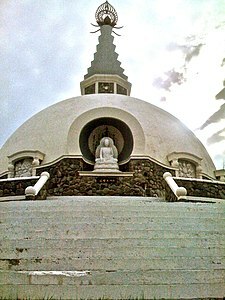 ^ "Shanti Stupa". Buddhist-temples.com. Retrieved October 19, 2009. ^ Kisala, Robert (1999). Prophets of Peace: Pacifism and Cultural Identity in Japan's New Religions. University of Hawaii Press. pp. 52–53. ISBN 9780824822675. ^ Stone, Jacqueline I. (2003). Queen, Christopher S.; Prebish, Charles S.; Keown, Damien (eds.). Action Dharma: New Studies in Engaged Buddhism. Psychology Press. p. 81. ISBN 9780700715947. ^ "Peace Pagoda". Milton Keynes Parks Trust. Retrieved 12 March 2019. ^ "Jun Yasuda- Faith Journey Interview with Buddhist Activist". Life on the Path. 2017-06-01. Retrieved 2018-11-26. 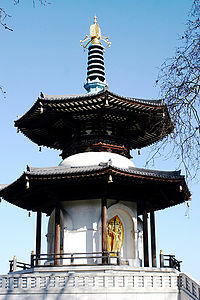 Wikimedia Commons has media related to Peace pagodas. Dharmawalk.org: Information on Nichidatsu Fujii, Peace Pagodas and the work of Nipponzan Myōhōji.